When giving CPR to an adult victim, use two hands on top of one another and press down on the chest, at a rate of 100 per minute. Be sure to let the chest recoil after each compression. 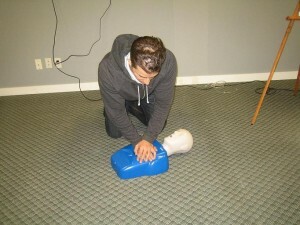 At Portland CPR, we offer trainees the best educational experience through high quality programs and affordable rates. Because we require all our trainers to be certified themselves before they can teach a class, you are sure to receive the best possible training. Certification is also awarded in both basic and advanced programs, whether you are a layperson or a healthcare provider. For rescuers who have expiring (not expired) credentials, we also have re-certification programs available. Visit our website for the online application you can fill out to enroll in a class! Every year, almost 600,000 Americans die because of heart disease. That’s 1 in every 4 American men and women. For both genders, heart disease is the leading cause of death. Back in 2009, more than half of deaths because of heart disease were men. Coronary artery diseases or CAD is the most common kind of heart disease that kills Americans, with a mortality rate of 380,000 each year. However, statistics very among different ethnic groups in the country. Out of the total deaths caused by heart conditions, 24.5 percent were African Americans, 18 percent were American Indians or Alaska Natives, 23.2 percent were Asians or Pacific Islanders, 20.8 percent were Hispanics, and 25.1 percent were whites. Depending geographic location, the area of the US with the highest heart disease rates were in the southwest states. According to a survey, almost 70 percent of responders reported that they would feel helpless in a situation where they needed to give someone CPR. This is why each year, the American Heart Association trains over 12 million people in CPR through their affiliate training providers. CPR training in basic and advanced CPR is offered at Portland CPR through the week to offer trainees a variety of schedules to choose from. Basic Life Support BLS courses focus on the basic skills in compression, ventilation, and defibrillation. These skills are not meant to provide long-term management, but rather mere stabilization before the arrival emergency medical help (the EMTs). Defibrillation is not something that is typically done by a bystander but preparing them for such an event where an AED is available is part of our BLS curriculum. Basic CPR and AED (Heartsaver) – General public, 4 hrs. Basic CPR and AED (Heartsaver C) – HCPs, 4.5 hrs. Basic Life Support for HCPs – 4.5 hrs. Basic Life Support for HCPs re-certification – 4 hrs. Advanced Life Support ALS courses are only for healthcare professionals, or HCPs who are allowed to medically manage patients. The courses cover topics such as medication administration, ECG reading, and physical and mental assessment. These are all skills that can only be done by healthcare professionals. Both our ALS courses have the same curriculum but vary regarding patient age group.